Strong El Niño conditions in the Pacific. Plenty of rain and snow in Northern California and the Sierras. But here in Southern California – and particularly in western Los Angeles County – gardeners are wondering ‘where’s our El Niño?’ Instead of record rains, we seem to be entering our 5th year of drought very early this year. And a dry winter means you’ve just got to water your native plants. 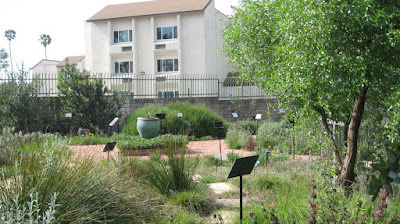 Many Southern California native plants are really drought tolerant. You can read about why at: http://mother-natures-backyard.blogspot.com/2015/10/how-things-work-plant-drought-tolerance.html But plants from western Los Angeles and Orange Counties need at least 10 inches of winter rain (or irrigation) to survive. 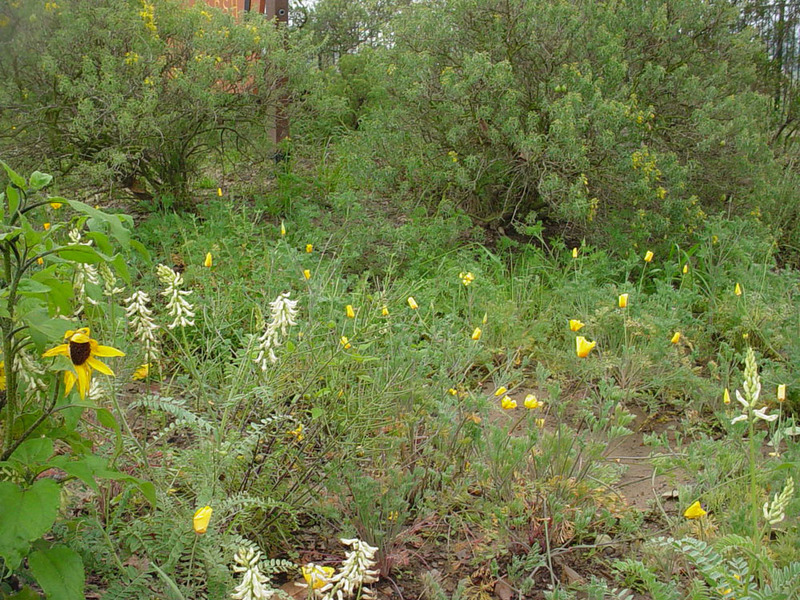 Winter rains are what make our local plants both water-wise and lovely. The rains allow them to cope with our long, hot, dry summer and fall. Southern California homeowners are struggling to meet their targeted 25% reduction in water use this winter. Local water companies recently bemoaned our 17% reduction compared to 2013. Which leads us to wonder: ‘Have they looked out the window?’ It’s dry this winter; and most of us don’t want to lose the mature trees and shrubs that shade and cool our neighborhoods. And so we water. Plants from Mediterranean climates are the best-suited water-wise plants for our region. They should dominate our home and commercial landscapes. Many are very water-wise in the summer/fall, when we most need to conserve water. They can result in significant yearly water savings when used to replace summer-thirsty tropical plants and wet-climate grasses. In fact, they are more water-wise than the semi-tropical succulents many people are now planting to conserve water. So water agencies, state officials and teachers should be encouraging gardeners to plant water-wise Mediterranean climate plants, and most importantly, California natives. But local water companies don’t yet seem to understand that Mediterranean climate plants, including Mediterranean herbs and citrus trees, must be watered in dry winters. And some dry winters are to be expected in in Southern California. Ideally, water budgets should take year-to-year variability into account; computerized data allow water agencies to do so. A ‘one size fits all’ approach to water conservation doesn’t make sense in times of rapid climate change. Our current water targets are based on 2013 monthly water use levels. And the 2012/2013 season, while dry over-all, started with a fairly normal winter (in which little supplemental water was needed). We were gardening along with the rest of you in 2013. So we know: our soils were moist well into spring that year without supplemental water. Some of us have been given ‘water budgets’ that specify the number of CCFs we can use each month (based on a 25% reduction from 2013 levels). A CCF is hundred cubic feet of water (the first ‘C’ is the Roman numeral for 100); one CCF is equivalent to 748 gallons. Five CCFs per month is about the lowest feasible level if you have any sort of a garden at all. A small family can get down to 3-4 CCFs per month with vigilant indoor water saving and almost no outside water use. 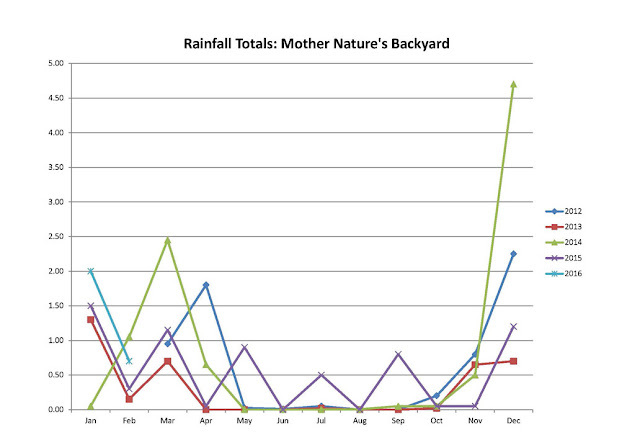 But it’s not easy to keep a garden going on 5 CCFs per month during a significant winter drought. Save as much water indoors as possible. Many of us still take sponge baths most days, wear our outer clothes longer between washings and use rinse water to fill our toilet tanks and water our plants. Water saved indoors can be used to water your garden plants. Prioritize your watering. Don’t waste water on plants that need replacing. Be sure that trees, large shrubs and other plants that provide shade, food or other important services get first priority. Check the long-range weather forecast. If no rain is predicted for the next 10 days – and if your soil is dry – you need to consider watering. Check your soil moisture. Dig down to a depth of 3-4 inches. If the soil is dry –and there’s no rain in sight - it’s time to water. Don’t rely on plants to tell you when to water; you need to check the soil. At this time of year, the soil should be moist; if not, you need to water. There is no substitute for checking your soil moisture. Check soil moisture in several places; water accordingly. Shadier, sheltered parts of the garden remain moist longer than sunny areas. Be sure to water only parts of the garden that really need it. Water and warm temperatures encourage fungal and other plant pathogens. By watering during a cool period you stand the best chance of avoiding disease problems associated with warm, moist conditions. Water at cool times of the day. We’ve done well with winter watering late in the day. The water has time to percolate into the ground overnight. Use watering methods that decrease evaporation. Trickle-water with a hose, use soaker hoses or old-fashioned ‘whirligig’ sprinklers that produce larger drops. Sprinklers that produce a lot of mist waste water. Remember that large, water-wise plants have extensive root systems. Be sure to water out to the drip-line and beyond. If you’re using drip irrigation to establish plants, move the emitters out as the plants grow. Have faith – we’ll get through the drought, although our gardens will likely evolve to accommodate our changing climate. Look at the drought as a challenge and an opportunity; a chance to make your garden even more alive and interesting than it is today. Consider ways to incorporate more native plants in your garden. And for now, if your Mediterranean climate plants need water, you’ll just have to water. 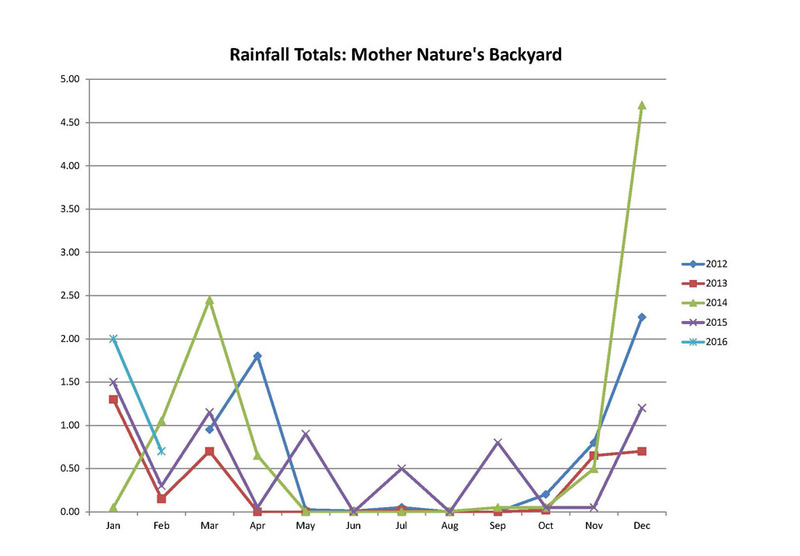 Despite forecasts of a strong El Niño season, we’re currently at only about half our normal rainfall. That’s worrisome! We’ve been watering Mother Nature’s Gardens, trying to saturate the soils, as they should be this time of year. 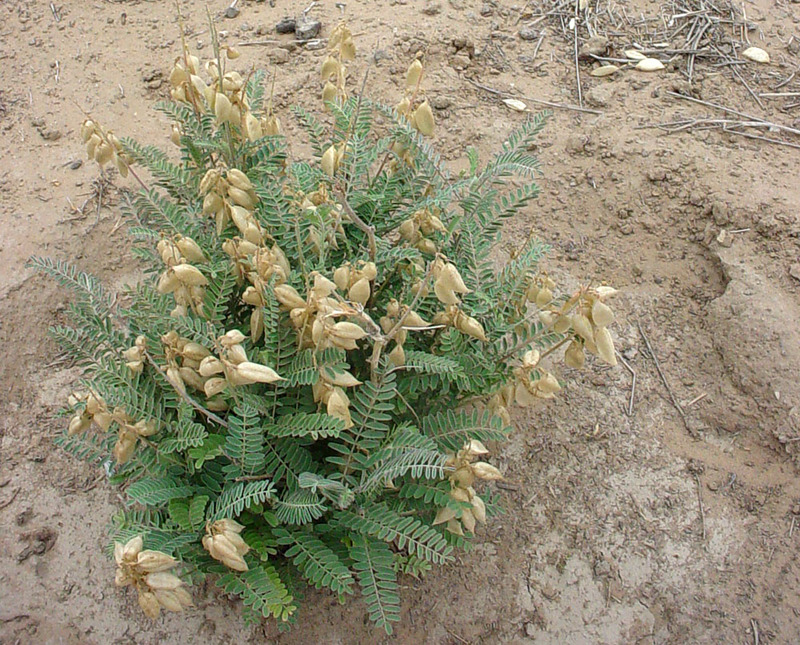 One plant that’s blooming right on target is the Rattlepod, Astragalus trichopodus. 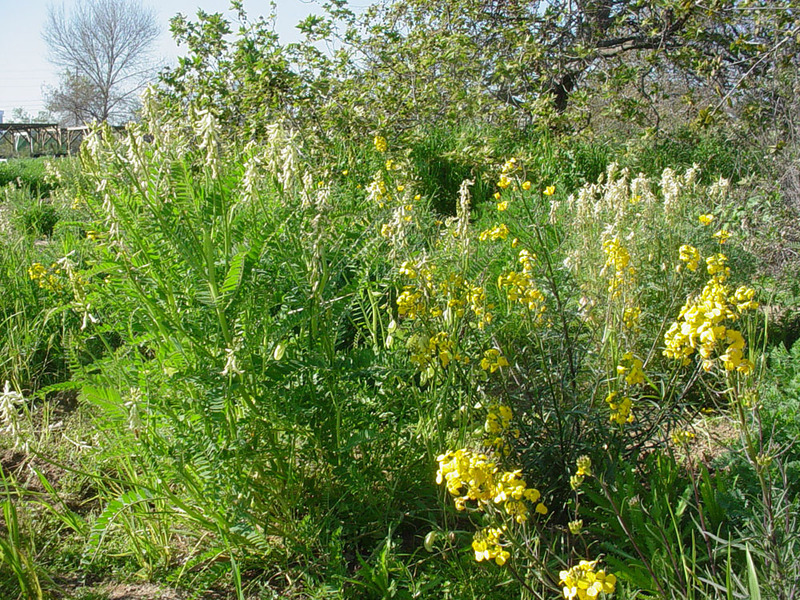 Rattlepod is known by several common names including Santa Barbara milkvetch, Three-pod milkvetch, Ocean locoweed and Ocean milkvetch. We prefer ‘Rattlepod’; a name that well depicts the plant’s most unusual feature. 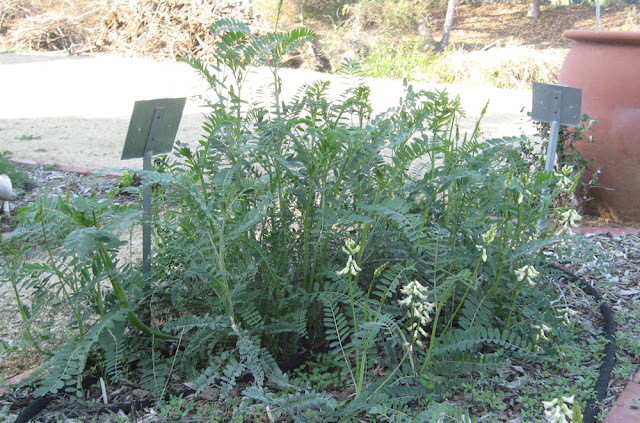 Three varieties of Astragalus trichopodus grow in Los Angeles County. 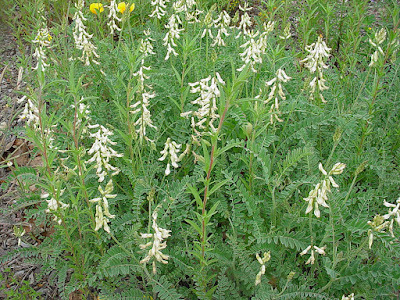 Astragalus trichopodus var. phoxis grows in the foothills of the Santa Monica Mountains, but is more common in the inland foothills of Los Angeles County (San Gabriel Mountains). Astragalus trichopodus var. trichopodus is found on Santa Catalina Island and the inland Puente Hills. Astragalus trichopodus var. 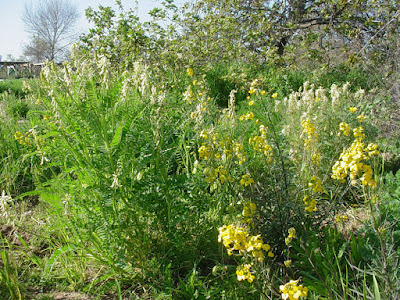 lonchus – the most common variety in Western Los Angeles County – was once widespread on the coastal plains and Channel Islands (less than 1000 ft. elevation) from San Luis Obispo County to San Diego County and Baja California, Mexico. Locally, it once grew on the coastal bluffs and coastal prairies of Playa del Rey, Hermosa and Redondo Beach and San Pedro. Specimens were also collected from the Dominguez Slough (now Gardena Willows Wetland Preserve). Planting Rattlepod in our Garden of Health brings this plant home. We hope to use seeds from our garden to re-populate Rattlepod on the Preserve. 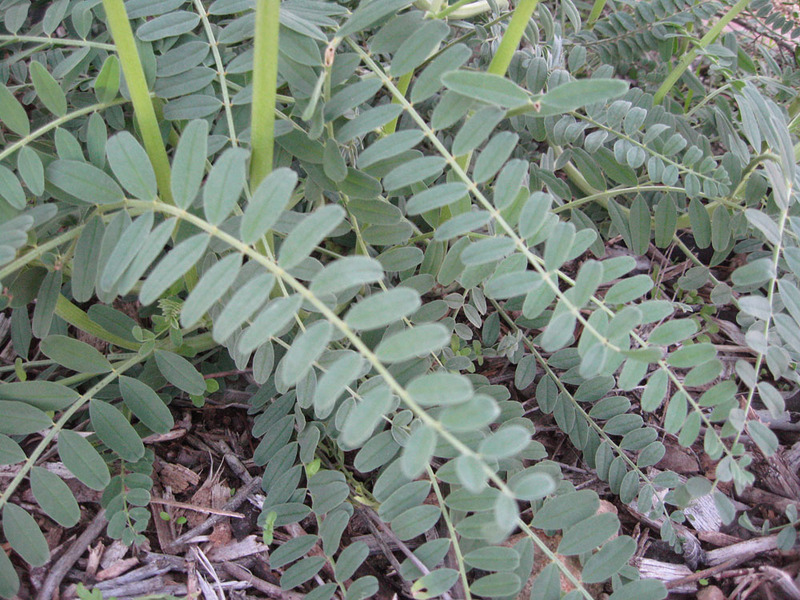 Since Astragalus trichopodus var. 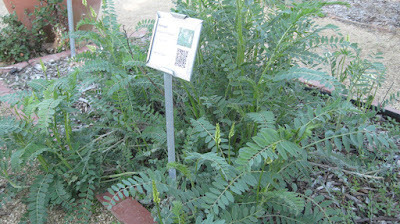 lonchus is the type grown in our garden, we’ll focus the rest of this article on that variety. Rattlepod is an herbaceous perennial in the Pea family (Fabaceae). It dies back to the ground in the dry season, emerging again with the cool rains of winter and early spring. Once conditions are satisfactory, it quickly grows to a bushy, somewhat sprawling perennial, 2-3 ft. tall and about 3 ft. wide. Although the stems are stout, they are herbaceous. The high winds last weekend knocked a few branches off the plant in our garden. The foliage is a bright spring green – the color of garden peas. Like most in the family, the leaves are compound, with 15-40 rounded leaflets along a midrib that can be up to 8 inches long (see above). The leaves of local plants are modestly hairy. We find the foliage to be unusual and attractive in the garden setting. All parts of the plant are toxic if eaten. This explains the common name ‘Locoweed’: domesticated horses, cows and sheep can become quite ill if they eat too much milkvetch. Rattlepod is an early-flowering species. It can begin blooming as early as January and almost never flowers later than early April in our area. 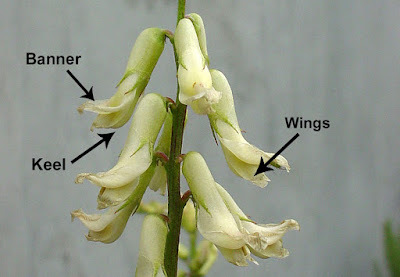 The flowers are a waxy cream-white and are arranged around upright stems. On close inspection (above), the individual flowers exhibit the usual characteristics of members of the Pea family. You can clearly see the banner and keel on the photograph above. The early flowers attract bees and other insects. 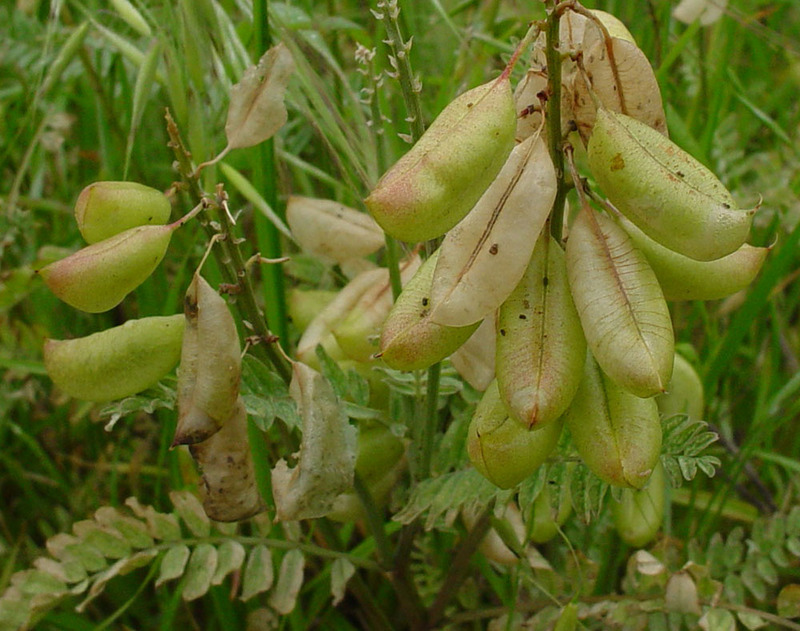 The seedpod of Astragalus trichopodus is rounded and inflated; the dry seeds rattle in dry seedpods, which explains this plant’s common name. While other vetches have inflated seedpods, Rattlepod deserves special attention; its pods are puffed up like little balloons. The pods are 1/4" to 3/4" wide and 1/2" to 1-3/4" long. Green when young, they gain pink tinges as they mature, finally becoming dried and tan (see above). Each pod contains up to 20 or so, pea-like seeds that become wrinkled when dry. Local gardeners on the Palos Verdes peninsula plant Astragalus trichopodus in the hopes of providing larval food for the endangered Palos Verdes Blue butterfly (Glaucopsyche lygdamus palosverdesensis). We like the plant because it also attracts other interesting insects – pollinators, early butterflies and others. The flowers and plant are pretty, and contrast well with other native plants. Rattlepods provide good winter-spring fill around larger plants. They also look nice with locally native cool season grasses, spring annual wildflowers and Wallflowers. We are not entirely sure whether Astragalus trichopodus has medicinal value or not. Asian Astragalus species are used for a variety of ailments, including viral illnesses. Chemicals made by several Astragalus species are being tested as possible cancer and AIDS treatment drugs. 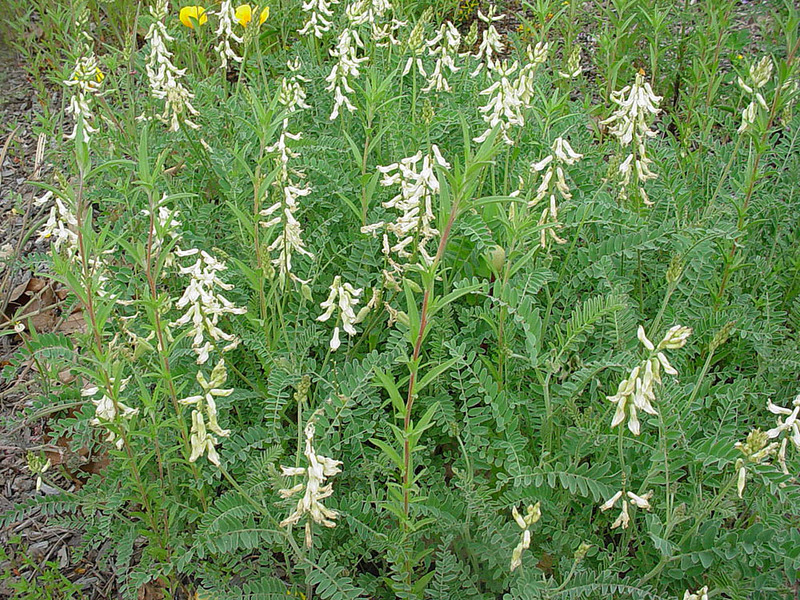 That being said, California native Astragalus species are toxic and should not be eaten. We’ll just have to wait and see whether compounds from local natives will be added to the medicine bag of the future.